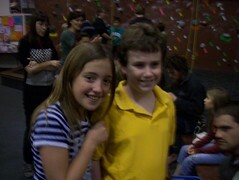 Ian is continuing to do well attending his class at College of Marin which Sara wrote about previously. As Ian’s first semester ends Sara will write again to relate how things went and what we all learned. In this installment I want to discuss what our motivations and ideas are as we work forward with Ian. Ian is a medium-verbal autistic and did not achieve a high school diploma. We had choices while Ian was moving through the public school system. Over time we found that it really boiled down to two paths: education or socialization. 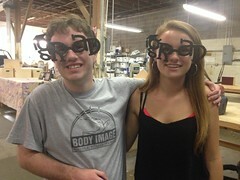 In pure special education settings (separate classes from the mainstream student body), Ian’s education was maximized. In full inclusion settings, Ian’s social skills progressed but his significant verbal deficits meant that he did not learn much of the curriculum. This either/or choice is a consequence of Ian’s need for focus to make progress. We have found this to be true in general for other people we work with. In our experience autistics(*) do not do well when trying to learn simultaneously on several different threads. While Neuro Typical (NTs) teenagers might be able to learn Math, History, English, a foreign language, Science, and age-appropriate social behavior all at the same time, we almost always find that people with ASD need to focus on fewer topics of learning to make good progress. Ian’s verbal impairment is significant and he needs to focus on just a few activities to make satisfactory progress. Since middle school we had unsuccessfully argued with the schools that Ian needed to be able to focus on fewer topics. It was very frustrating for us when Ian’s middle school special education teacher tried our suggestion for a couple weeks, reported great progress but because he did not have administrative support to continue he immediately returned to the same multi-topic approach we all knew did not work as well. In any case, we knew Ian needed focus. As Ian approached eighth grade we started looking at choices for high school. Ian had been with a large cohort of regular ed neighborhood students since fourth grade. They knew Ian, liked him and looked out for him. Almost all of these students were going to be moving to Redwood High School across the street from the middle school. However, our high school district has concentrated their services for autistics and other special education programs at Drake High School further away and with an almost totally new group of students. Ian wanted to go to Redwood with his cohort. The District wanted Ian to go to the other school. This presented us with a difficult but clear choice. With all the special education resources at Drake, Ian would have one-on-one support and classes modified to his level. 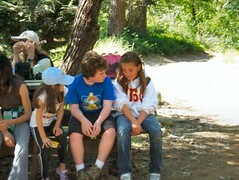 At Redwood, Ian would have no one-on-one support and only a slightly modified classroom experience. The district’s choice would be better for Ian’s education. Ian’s choice would be better for his social skills and learning independence. The final piece was when Janet and I asked ourselves: will Ian’s education be done at the end of his senior year, or will he need more education after high school? Ian’s language difficulties meant that if Ian was going to get a high school diploma it was going to be a very hard four years. We have worked with other students who struggled hard to get the diploma and most refused to do any more education afterwards as they were tired of the hard grind. We made the choice that Ian’s education was going to be a long haul. We realized that our goal for high school was that Ian acquire the skills to be able to continue his education after high school. That meant enjoying school enough to want to continue. 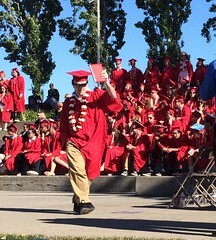 Ian attended Redwood high nearby and left in 2014 with a certificate of completion. Frankly, Ian is not fully on board with the plan that he attend community college part time and work part time, possibly for many years. The near term goal is a GED and possibly attending a four-year college afterwards. When asked, Ian’s idea of college and his living situation is based on the movie “Animal House.” He sees himself living with a group of young people having fun. Besides starting college this semester, Ian moved out to a house nearby with three other autistic young men last month. We’ll write about THAT soon. * As a parent of a child with Autism Spectrum Disorder (ASD) and as someone who has chosen to immerse myself in this work I will often use “autistic” to mean either “symptoms of the diagnosis of autism” or “a person with the diagnosis of autism.” Similarly I will use ASD to mean either “Autism Spectrum Disorder” or “a diagnosis of Autism Spectrum Disorder.” I have Asperger’s Syndrome and I will often use “aspie” to refer to individuals with Asperger’s Syndrome.